A man was stabbed to death after an "exchange of money and drugs" in front of two small children, a court heard. Bhekisipho Mudise Dube, known as Marcus Harper, 28, died in March in Corringham, Essex. A post-mortem revealed he suffered 25 stab wounds, including a fatal wound to his left lung that was seven inches deep. 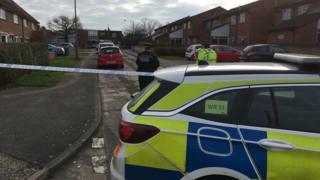 Gilbert Morgan, 24, of Lincoln Road in Basildon, denies murder. Basildon Crown Court was told Mr Morgan drove to meet Mr Harper on Queen Elizabeth Drive on 21 March at about 1930 GMT, with his two children, aged five and three, in the back of his car. The court heard Mr Harper got into the passenger seat, after which there was an "exchange of money and drugs", and then Mr Harper pulled out a kitchen knife. A tussle followed, and Mr Morgan turned the blade back on Mr Harper, the court heard. The court was told he was acting in self-defence. Mr Harper died at the scene.